A late Kieran Dunbar strike sealed three points for Leamington in what proved to be a low-key league contest at the Impact Arena on Tuesday night. Billy Heath rotated the side with David Lynch, Craig Hobson, Curtis Bateson and Nathan Hotte all starting. James Clifton returned from suspension and was on the bench. The early stages of the game saw both sides looking to control the ball with loose passes and interchanges between players difficult, Leamington had an early free kick on the left which Sam Ramsbottom claimed after Shiels headed high into the sky. 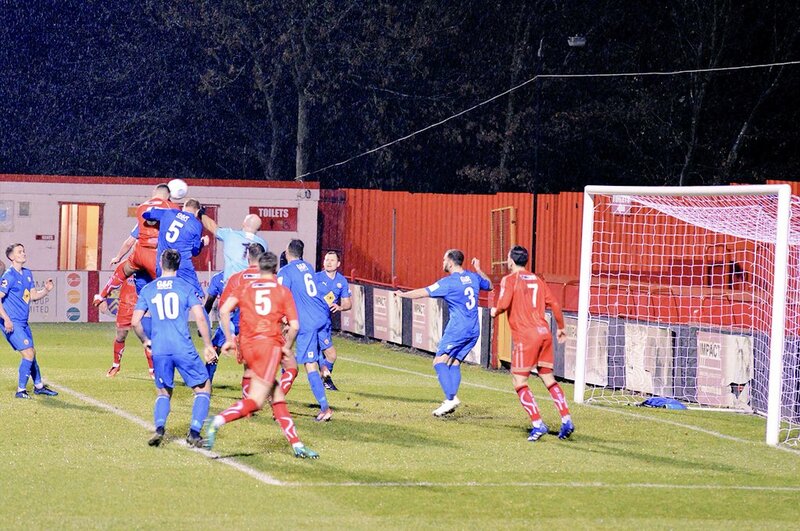 Alfreton were having more joy of the erratic possession and were unlucky not be awarded a penalty after Craig Hobson looked to be held as he went to ground in the box from a flick on. Josh Wilde's cross was cleared before Callum Chettle flashed a volley wide. Curtis Bateson swung a wonderful ball in from the left wing but Martin Riley, nor any other red shirt could connect. The Reds were upping the pressure and it led to several scrambles in the Brakes box, Tom Allan put Chettle through on the right side of the box, Chettle's cross was cleared to Nathan Hotte's feet only for the resulting shot from Allan being blocked. Josh Clackstone had an effort blocked away which led to back to back corners which came to nothing. Chettle had another sighter of the Leamington goal with a free kick which went just wide of the left post. The Brakes first effort of the game came on 33 minutes as Edwards powered a header over the bar from a corner. However with 43 minutes, Leamington took the lead as Dunbar's corner was headed home by Edwards, this stunned the Reds who had the majority of the first half chances in what was a low-key first half for the visitors. The second half saw the Reds start brightly again, Chettle produced a brilliant ball to the back post from the right but Hobson couldn't connect on the stretch. Further clearances came to deny Lynch before Breeden in the Brakes goal punched a Bateson corner only as far as Hotte, the midfielder found Shiels but the Captain's nod down was to an offside Hobson. James Clifton was introduced and his first involvement was a stunning ball from a free kick which again we came so close to connecting with at the far post. The second period was ticking away as the Reds urgency was there but too often it was that final connection on the ball from a cross or we were looking to be too intricate in our build up which led to attacking break downs. Chettle nearly found a leveller with an effort with the outside of his boot which went just wide of the far corner inside the box. However with 80 minutes on the clock, we did level the game. A Jordan Sinnott corner found Shiels who glanced a header into the far corner to the delight of the Reds faithful behind the goal. But our leveller lasted just a few minutes, as Dunbar was slid through by Taylor and he finished low under Ramsbottom; an utter sucker punch to Alfreton. That proved to be the last opening of the game and the Reds will be so frustrated to have got themselves back in the game only to have conceded just minutes later. Although we created some good openings in the game, we didn't take full advantage of our dominant spells and it's a set-back in the league after the Nuneaton win on Saturday. Next up, we host Farsley Celtic in the FA Trophy Third Qualifying Round on Saturday with a 3pm kick off. ATFCXI: Ramsbottom, Clackstone (Clifton 54), Wilde, Lynch (Sinnott 77), Riley, Shiels (c), Chettle, Hotte, Hobson (Peniket 59), Bateson, Allan. Subs Not Used: Nicholson, Platt.